Tip: By changing the proportions of red wine to beef stock, you can change how pronounced the wine flavor is. More wine will give you a more distinct wine flavor, less will emphasize the natural beef flavor. Tip: For a heartier, more intense sauce, remove the bones from the roast after cooking and leave them in the pan while the sauce reduces. For a more refined presentation, pass the sauce through a fine mesh sieve, then spoon over meat. 1. Cook roast in a roasting pan at 350ºF (180ºC) until just before desired doneness, approximately 2 hours Remove roast from oven and rest, covered; on a carving board or serving platter. 2. While the roast is resting, pour off excess fat from roasting pan and place over medium-high heat. Add garlic and shallots and sauté 1-2 minutes. 3. Add thyme and red wine to deglaze pan, scraping up any browned bits from bottom of pan and simmer until wine is almost cooked dry. 4. In bowl, dissolve the corn starch into the warm water. Add beef stock to the pan and simmer until reduced by half. Gradually add corn starch mixture, an ounce or two at a time, until sauce reaches a slightly thickened consistency; it should just coat the back of a spoon. 5. 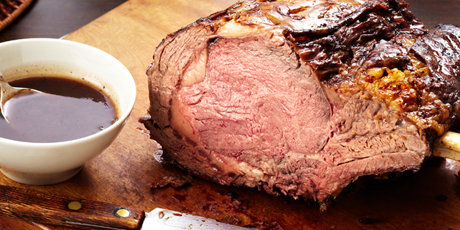 Slice roast and serve with red wine and shallot jus.